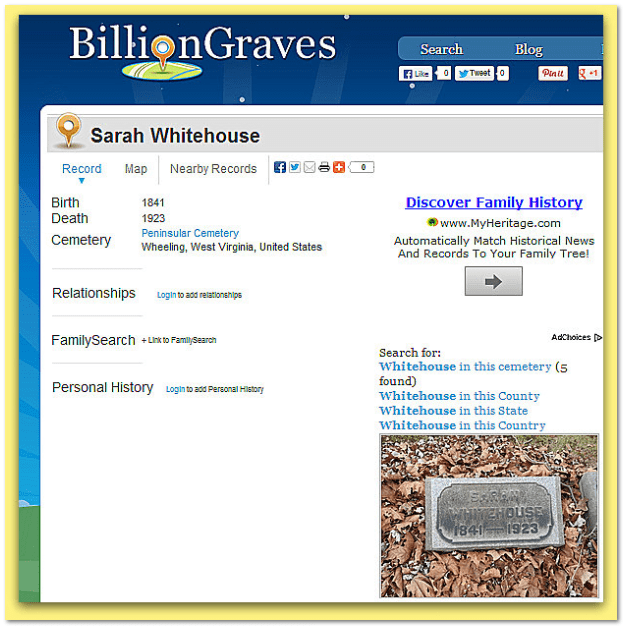 Continuing our series on the top genealogy websites that will save you time and get you 24/7 access to the data you need and will rely on in your family history research, our next category is the best websites for cemetery and burial records: National Gravesite Locator, Find-A-Grave, and BillionGraves. This important website, created by the U.S. Department of Veterans Affairs, lets genealogists quickly locate military and veterans’ burials from 1997 to today. This cemetery website is updated daily and includes all persons buried in the hundreds of officially-designated U.S. federal and state military cemeteries. These military cemeteries permit the burial of the service member and their spouse. The online index gives you the core genealogical information: each person’s name; dates of birth and death; name and rank of the person that served in the military; and the name and contact information for the military cemetery. All of this is available at your fingertips 24/7 online. This cemetery website is updated daily. These essential online cemetery websites rely on crowdsourcing to grow. 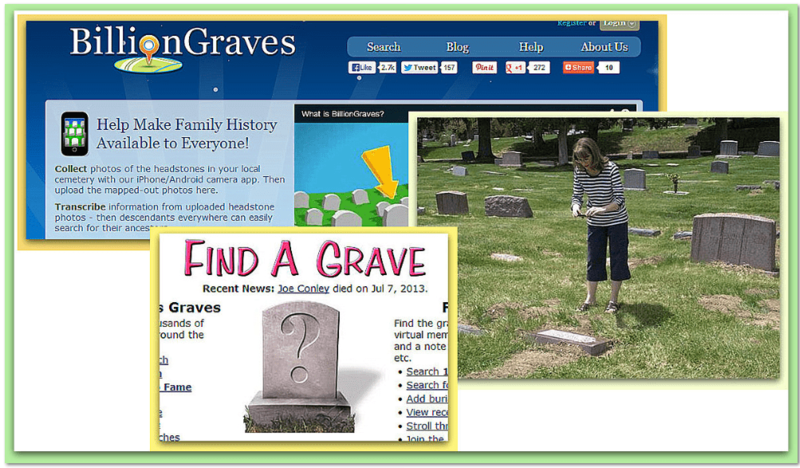 As the above photo shows, individual genealogists take pictures of the graves that interest them and upload them to these two websites. “Many hands make light work,” allowing these cemetery websites to grow quickly. BillionGraves has over 4.2 million photographs of individual gravestones. Genealogists using Find-A-Grave routinely add an image of the tombstone, and also old family photographs and a biography of the deceased. Since this content is all online photographs, documents and similar items may be added to each individual’s memorial page by all interested persons. I decided to test how easy it is to add photographs of a tombstone and of the deceased to these cemetery websites. Bang. Within just a few minutes I was registered on Find-A-Grave and uploaded a photo of my great-grandfather John Henry Kemp’s grave along with his portrait. This was simple and easy to do. 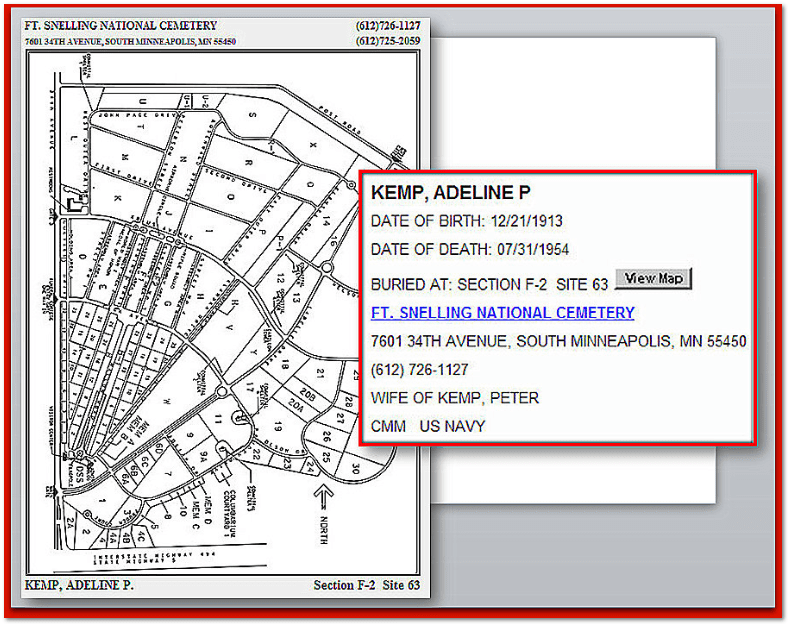 I encourage all genealogists to hold nothing back: put all of your family’s information, documents, and photographs on cemetery sites like these, and on Ancestry.com and FamilySearch. It is essential that we preserve and protect our family history information by putting our genealogy records on multiple websites. Ensure that the information about your family tree that you have gathered over years of genealogy research is not lost, but is permanently available for you and the rising generations. I have used all of these sights with success. I particularly love Find a Grave, and have contributed info to them as well. Lots of free info on the internet, just have to be persistent and patient. This is a very helpful post. I would just caution volunteers adding names to Find A Grave to first search to see if the name is already there. There should be only one memorial for each person – it’s not like Ancestry or other genealogy sites where there can be a multitude of duplicates. Also, many of the volunteers are not interested in genealogy but in documenting where people are buried – and volunteers, not indexing, are responsible for adding names and cemeteries. Not everyone adds pictures. One last thought – If you find a picture on Find A Grave that you want for your tree, please ask permission from the volunteer photographer to use it. It’s a great site – hope readers of your blog become volunteers, I enjoy it! I am looking for ANY information regarding the death of my former husband Peter Caponera originally from Danbury, Connecticut. I believe his date of birth to be 4 January 1933, his date of death to be around the week of 15 Nov. 1977. His Social Security No. was 046-24-7515. The limited information I received from FIND-A-GRAVE was that he was buried in St. Peter’s Cemetary, and their address is Lake Avenue extension, Danbury, Connectcut, with zip of 06810. His Service info said he was a Private in the Army, in Korea. (befor 1951), and that his last residence was 85006 Phoenix, Maricopia, AZ, USA. I also picked up two other addresses as:7318 E. Vista Drive, in Scottsdale, AZ, 85250-7152 and 6405 E. Indian School Road, Scottsdale, AZ, 85251-5153. Apparently the address he grew up was at: 12 Linden, Danbury, Fairfield County, Connecticut. The names of his father, mother and sibblings are in that order: Father: Otilla (Arthur) Caponera, Mother: Frances C., and siblings are: Josophene, Jilda, Christine, Rose, Frank, and Joseph. All originally with the last name of Caponera. There was a mention of a car accident having to be involved in his death, in Arizona. Please respond to this email and let me know if you have any other questions. Hi, I am not sure what you are looking for? Most of the information you have is correct according to Ancestry.com. You didn’t mention his divorce in 1974 in California. The date of his death is probably correct in the Veteran’s grave Database – it shows 5 Nov 1997 instead of the 15th. It looks like the 5th is correct since his obituary was posted on 12 Nov 1997 in the Danbury News Times. If you email the funeral home listed in the obituary I am sure they would check their records and give you the correct date of death. I couldn’t find an Arizona paper with an obituary or any mention of his name for any years. I find that odd considering it said he owned an advertising company. That is very true, and sometimes the records that they use have the name misspelled but you can contact the person who submitted it and most times they will correct their information especially if you attach a picture of the tombstone. I use Find A Grave regularly and it is a very worthwhile site. 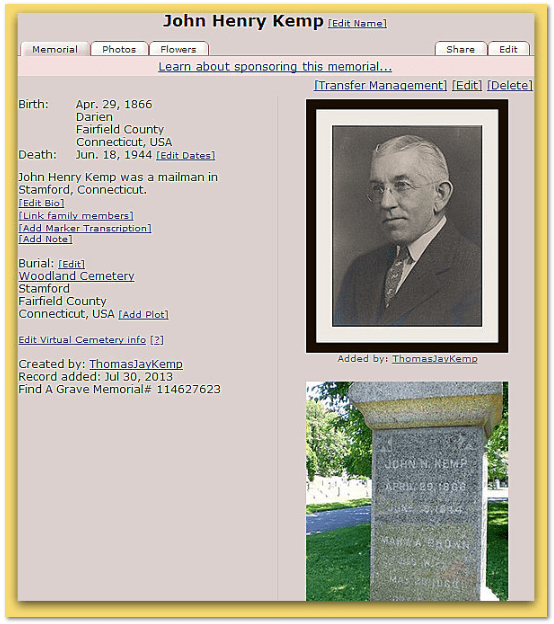 I have become very involved with the Findagrave.com website. You can connect relatives to others to help others out. You can message the person that put this person’s info on to have things added or changed or even ask to be the “caretaker” of that individual if you are directly related to them. Most people are very friendly and very helpful. And you can also request a picture of a tombstone if there isn’t one already and some one in that area may go out to help you get a picture. It is pretty awesome. I am trying to find my Aunt. I only know her maiden name. She was killed in a car accident in the State of Texas. Not sure the exact year. I have looked and looked. Can U help me? My Aunt was born as Idell Newsome from Southport, FL . She lived in Panama City, FL at one time but when she married she moved to Texas. All of my Grandparents and parents as well as Aunts/Uncles are all gone.